Not Sure Whether To Rent Or Buy? Check the Heat Map. I can’t resist a good heat map, especially on real estate sites. 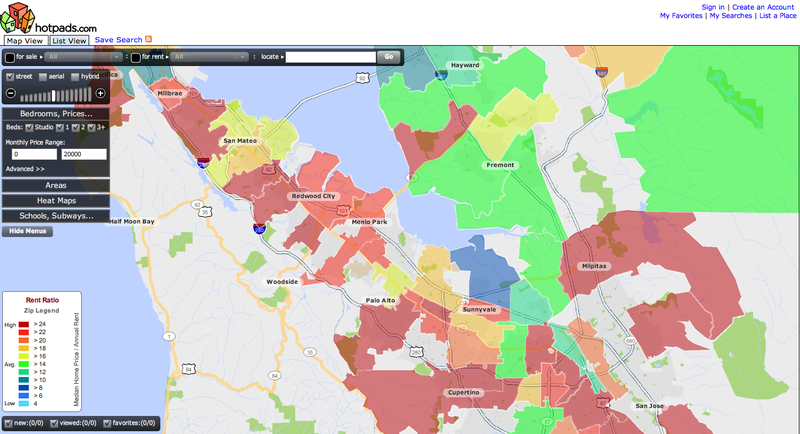 HotPads, which brought us the foreclose heat map, now offers a handy rent ratio heat map. The rent ratio is a home’s sale price divided by the annual rent of a comparable home in the same neighborhood. Looking at the rent ratio gives you a quick sense of whether it makes more sense to rent or buy in a particular neighborhood. If the ratio is high (red on the map), it is usually a good indication that you are better off renting. If it is low (blue on the map), you are better off buying. In the map above for New York City (click on the image to make it larger), it shows that people are better off renting in Tribeca and Soho and buying in the Lower East Side and parts of Brooklyn such as Brooklyn Heights and Williamsburg. For Silicon Valley, you are better off renting just about everywhere except part of Sunnyvale. The Rent Ratio heat map is part of a soup-to-nuts redesign for HotPads that includes improved search.